A recent call for a FREE mold inspection at a home in Harwich presented an issue we do occasionally come upon – – hoarding. The home owner had recently passed away and the family called us in for help. Every room in the house was packed from floor to ceiling with boxes, clothes and food, leaving nothing but a series of narrow pathways to make way from one room to the next. The resultant lack of air flow, coupled with water leaks and cats had led to a considerable mold and bacteria issue. Without having to identify the “keep” and “throw out” items, we quickly filled a 40 yard dumpster and had all of the house’s content hauled away. We also called in our Pest Control division, Cape Cod Pest Pros, to treat the home for fleas from all of the stray cats. Once the house was empty, and all pests had been removed, we were able to identify the source of the water leaks and repair them; remove and clean up the mold; apply our bacterial treatment protocols; and, restore the house to safe living conditions. 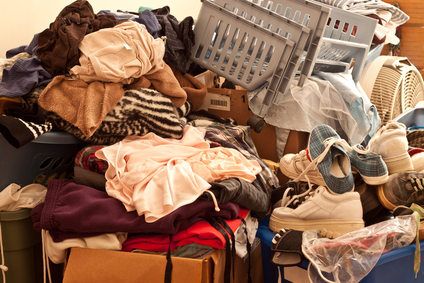 Hoarding is a serious matter, and we saw first hand the problems it creates beyond the human element. The lack of air flow it causes, along with the other conditions conducive to mold growth, can lead to a major job of mold remediation even after the contents of the house are removed, as we saw in that Harwich job.